Recently, Microsoft has announced the latest preview release of Blazor 0.8.0 which upgrades Blazor to use Razor Components in .NET Core 3.0 and addresses some critical bug fixes. According to the company, Blazor 0.8.0 is primarily focused on first integrating Razor Components into ASP.NET Core 3.0 and then rebuilding Blazor on top of that. For the future, the company plans to ship Blazor updates with each .NET Core 3.0 update. This release includes some .NET runtime improvements, such as improved runtime performance on Chrome and an improved IL linker. Blazor 0.8.0 performance on Chrome is now about 25% faster, claims the company. Additionally, now you can also reference existing libraries like Json.NET from a Blazor application without any additional linker configuration. Now, server-side Blazor is being shipped as ASP.NET Core Razor Components in .NET Core 3.0. The company has integrated the Blazor component model into ASP.NET Core 3.0 and renamed it as Razor Components. 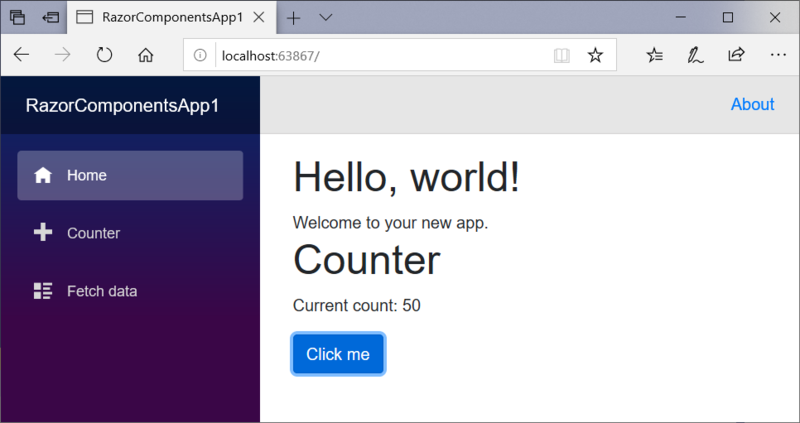 Blazor 0.8.0 is built on Razor Components and allows you to host Razor Components in the browser on WebAssembly. Earlier, to get tooling support for Blazor projects developers were required to install the Blazor extension for Visual Studio. But now, starting with Visual Studio 2019 Preview 2, tooling support for Razor Components (and hence Blazor apps) is already included without having to install anything else. The Blazor extension will only need to install the Blazor project templates in Visual Studio. "It was not possible to find any compatible framework version. The specified framework 'Microsoft.NETCore.App', version '2.0.0' was not found." You may see the above error while building a Blazor app because the IL linker currently requires .NET Core 2.x to run. To work around this you can install .NET Core 2.2 or disable IL linking by setting the <BlazorLinkOnBuild>false</BlazorLinkOnBuild> option in your project file. "Unable to generate deps.json, it may have been already generated." This error arises when running a standalone Blazor app and you haven't yet restored packages for any .NET Core apps. To work around this, create any .NET Core app (example - .NET new console) and then rerun the Blazor app.